The artist’s signature, capped by a swirling flower, is as delicate and as intricate as is her mural in IIT Tower—a 3-foot by 7-foot outline of a tall building filled with a hand-drawn landscape of black and white leaves, buds, curlicues, and an occasional peeking panda. Fatima Azfar (CS 3rd year) says that while her personal sketchbooks brim with page upon page of increasingly elaborate visual realms of her imagination, she never thought that she could parlay her talent into a paid profession—that is, until she had slain the dragon. Azfar participated in a new Interprofessional Projects (IPRO) Program course called Dragon Slayer (Designing YOUR Future), offered at Illinois Tech for the first time this past spring. It is modeled after the late American mythologist Joseph Campbell’s iconic “hero’s journey” story, about an individual undertaking a life adventure, obtaining a victory over crisis, and then returning home transformed. Dragon Slayer has benefitted Azfar in several ways. Before enrolling in the IPRO she had been designing flyers and posters as a volunteer for ICNA Relief Chicago. 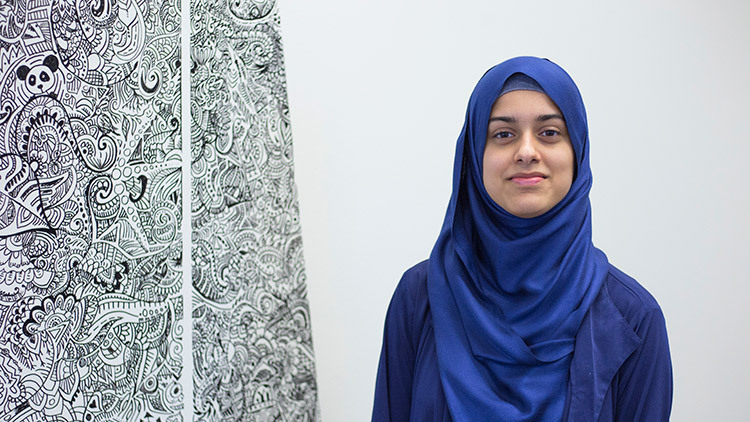 The intimate environment of the course gave Alexis the chance to learn about Azfar’s creative efforts and he offered her the chance to design a mural for the relocated Idea Shop in IIT Tower. Also, in her role as a peer career coach for Career Services, where she assists fellow students by reviewing resumes, LinkedIn profiles, and other documents, Azfar now better understands the process by which students can discover and manage their futures, by better understanding her own journey. Students in the IPRO course spend a fair amount of time reflecting, whether through directed discussion or activities that lead them through the stages of the hero’s journey. One exercise gives students the chance to be a chief executive officer, a chief experience officer, and a chief technology officer to see which distinctively different role suits them better. Real-life leaders then visit with the students to answer their questions. In one of her exercises, Azfar and her IPRO team came up with the concept of “fun zones” within Career Services, such as a station where students can try their hands at making their own business cards, and is now working with Skala to further develop the idea.